How are the new bus schedules treating you? 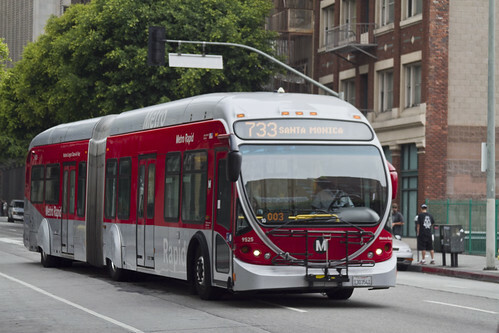 The new Metro Rapid 733 heads to Santa Monica from Downtown L.A.
Metro’s new bus schedules went into effect yesterday, and I have to ask – Monday commuters, how is the shake-up affecting the start of your work week? Is anyone out there riding the new Rapid 733? Does it live up to its moniker? Are the other changes subtle enough that your commute is unaffected, or are shaking your fist at Metro? It looks like Google Maps has been updated to reflect the changes – how about your other transit apps? Let us know by sending us an email, leaving a message on Facebook or tweeting us. Oh, and if this all comes as a surprise, you can read about the service changes here and download the new schedules here.